A friend on my Facebook posted a recipe from Kraft on which I based this recipe (thanks, Diana!). My family is selective in their tomato consumption, so canned tomatoes only get eaten if I puree (hide) them in sauces. They do like salsa though, so I used a small jar (440ml) of salsa instead, and loaded up the bell peppers instead. You can add shredded cheese on top, diced avocado, cilantro, etc. Spoon salsa on the bottom of the slow cooker pot (enough to coat the bottom), then place roast beef on top. Sprinkle taco seasoning on the roast. Add bell peppers, onions and corn to the pot around the sides of the roast. Add remaining salsa on top of beef and vegetables. Cover and cook on low for 6 hours. Cook rice according to the package just before cooking time on slow cooker is complete. Set aside. Remove roast beef from slow cooker and slice into cubes on a cutting board. 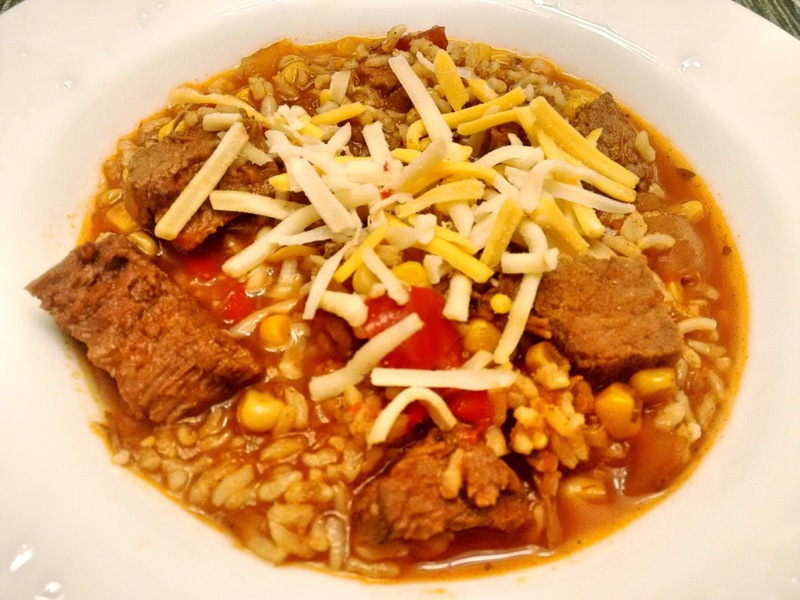 Add cubed beef back into slow cooker. Add rice into slow cooker and stir. Scoop into bowls and serve. Optional: Top with shredded cheese, diced avocado, cilantro, etc.